A huge cleanup operation is underway in the city of Chelyabinsk in Russia after a meteorite strike caused significant damage to the region. Over 3,500 buildings, that are home to 100,000 families, have had windows restored after the city was hit by the meteorite last Friday. 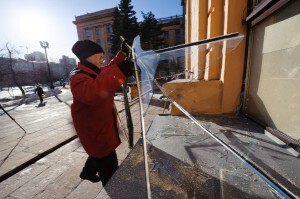 The largest damage was caused by shattered glass and the number of injured stands at around 1,200. According to NASA, this was the biggest meteor to hit Earth in more than a century. A monumental cleanup effort is under way in Chelyabinsk with authorities deploying around 24,000 troops and emergencies responders to help in the effort. The devastation caused by the meteorite cost the state budget around one billion rubles ($300 million). 19 people injured last Friday remain hospitalised in the region. The meteorite split into seven large fragments with the largest one falling into the Chebarkul lake, forming a hole in the ice of about eight metres in diameter. Scientists now suggest calling the meteorite after the lake’s name – Chebarkul. Tests discovered the stony meteorite contained at least 10 per cent of iron. NASA estimates the meteorite was around 15 metres in diameter, weighed over 7,000 tons and travelled faster than the speed of sound. Thankfully most of the meteor burnt up as it hit the atmosphere. In the meantime Russian police is probing into ‘online offers of meteorite sale’. “Information posted online about the sale of meteorite fragments is being thoroughly checked,” said Andzhela Chirikova, head of the regional police department’s press service. NASA astrophysicist Nikolay Gorkavy suggests creating a Meteor Museum. “That’s a historic event and I advise to preserve the evidences of this space bombardment. It’s necessary to create a special exposition, thoroughly recreating the events: with computer 3D reconstruction of the flight and burst of the bolide,” the astrophysicist wrote in his blog.